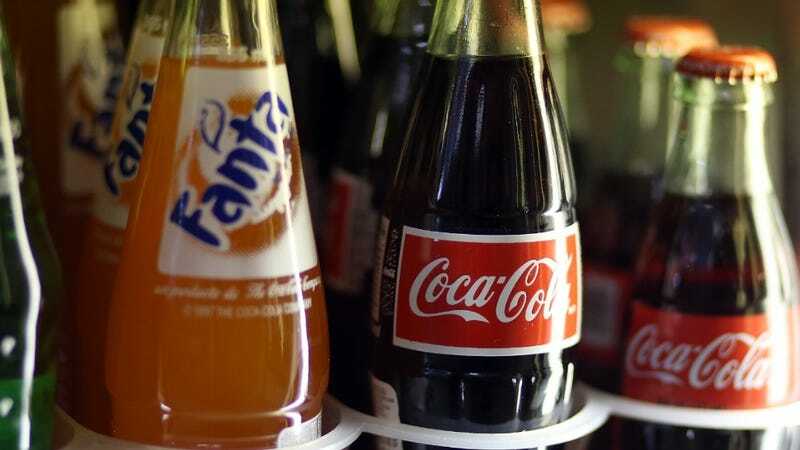 America's three biggest soda companies, Coca-Cola, Pepsi and Dr. Pepper Snapple Group, have reported declining sales in the last quarter. And though it may seem that health-conscious Americans are probably opting for the diet versions of their favorite speshal juice, it's actually the diet versions of sodas that are declining the most. That might be because too much diet soda makes your teeth look like a meth head's, but that's just my guess. Coca-Cola reported a 4 percent decline in North American sales, with Dr. Pepper at a 3 percent decline. Pepsi declared its decline was in the "mid-single digits." Coke blames the sales decrease on a "cold, wet spring" because Coca-Cola Trees don't bloom well in that kind of weather, apparently. Despite frantic efforts by soda companies, like Pepsi paying one trillion billion dollars for Beyonce in its ads and a 10-calorie soda line, sales are still steadily decreasing. But don't cry for gigantic soda corporations- they've still got a plethora of beverages to sell to you and to overseas markets, where people still haven't suffered from the excesses of wealth! Either way, this may signify the waning of America's favorite beverages. Yes, the days of yore, full of bubbling rivers splashing with brightly colored, sugary carbonated delights are nearing a close. I mean, what the hell are Americans drinking if not soda? What could possibly fill the gallon-sized, Big Gulp hole in our hearts? Oh, energy drinks and sugary juices. Keep doing you, America.